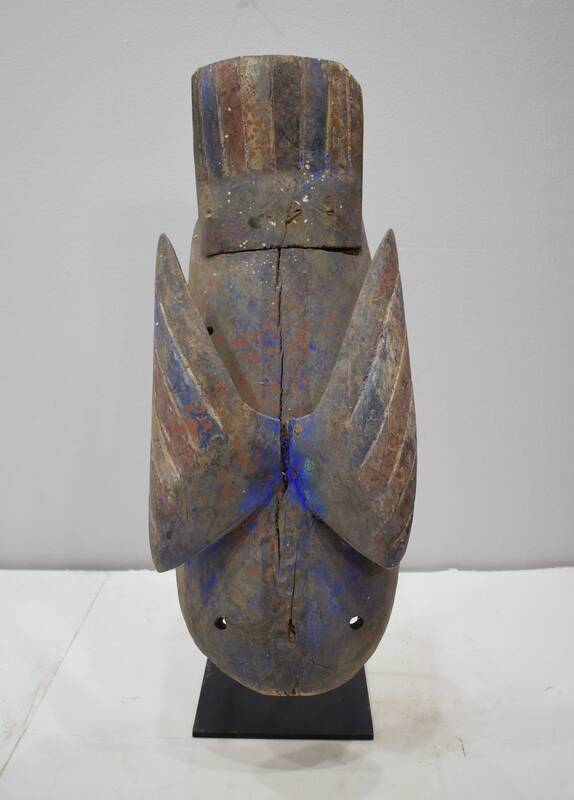 This is a old and unique Yoruba Abstract Bird Mask that comes from Nigeria. Yoruba masks are worn by a traditional healer to drive evil spirits from the possessed person. The arts of the Yoruba are numerous in form, Beautifully sculptured and or carved art pieces are placed on shrines to honor the gods and the ancestors. The masks form an important part of ceremonies, rituals, initiations, celebrations and secret communities. The use of African masks typically includes song, prayer, and dance. It is for this reason that the mask can be viewed as an obvious work of sculpture art, but because of its function, it is also considered a performance art form. Yoruba masks are mainly crafted from wood. THis old mask would be a wonderful addition to your collection. Shows age, has cracks down center, discoloration, but in good condition.